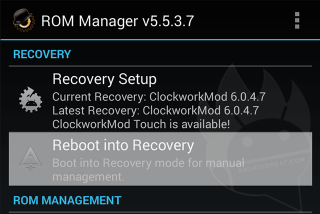 For those not familiar, ClockworkMod recovery – also known as CWM recovery, is one of the most popular custom recoveries available for the android devices. Some of the core features found in Clockworkmod recovery includes Nandroid backup and restore, recovery, installation or restoration of custom or official ROMs. Your device recovery is not a separate partition but comes built into the kernel itself. Samsung Galaxy devices and many Sony devices fall in this category where you need to flash a kernel containing the ClockworkMod recovery using ODIN or FlashTool. Your device doesn’t officially run android OS but Android has bee ported to run on it. Therefore requires special method to install CWM recovery. HP Touchpad and HTC HD2 are the examples of such devices. Since it’s not feasible to cover methods for all the devices in a single guide, we will cover the standard two methods that should cover most of the devices out there. Let’s talk about both the methods mentioned above to install CWM recovery. Installing Clockworkmod using ROM Manager is the easiest among the above mentioned methods. However it requires your device to be rooted first. 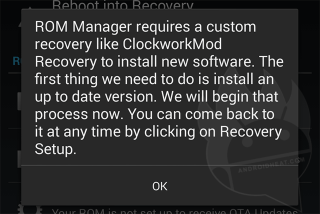 So if you’re going to use ROM Manager to install ClockworkMod recovery, first root your Android device. Open the Play store on your device, search and install ROM Manager. ROM Manager allows you to install latest version of CWM recovery and schedule different recovery related task while booted into the Android. There’s an ad-free premium version also available. Open the “Rom Manager” that you just installed. It should offer you to “Flash ClockworkMod Recovery”. 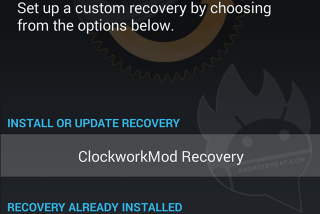 Tap ok.
Now Select ClockworkMod Recovery under “Install or update recovery” options. Then tap on your device’s name and then tap on “Flash ClockworkMod Recovery” to begin the downloading process. After the download, grant SuperUser access if it asks. 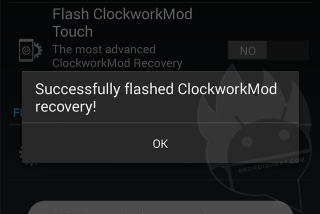 The recovery will be flashed and then “Successfully flashed ClockworkMod recovery!” message should appear. Tap OK.
Now tap on “Reboot into Recovery” and then hit OK. Your phone should reboot into ClockworkMod recovery, if it does, you’ve successfully installed CWM recovery on your android phone or tablet. Or you can manually boot into recovery by shutting down your phone or tablet and then using the Volume down or volume up and power buttons combination. One major benefit of installing ClockworkMod recovery using Fastboot is that it doesn’t even require you to root your device first. However, your bootloader must be unlocked prior to using this method. Checkout our detailed guide on how to unlock bootloader. If you’re going to use Fastboot to install ClockworkMod recovery on your android device, carefully follow the steps mentioned below. WARNING: Make sure the recovery image you download is compatible with your device, or installing it may mess up your device. 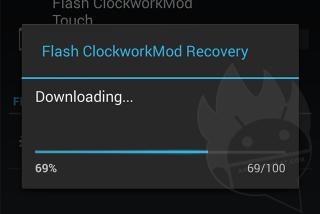 Download the latest recovery image file from ClockworkMod Recovery download page and copy the downloaded recovery file in the same folder where fastboot and adb files are located. Note: The recovery image must have .img extension. If it’s a .zip file, make sure to extract the .img file from it before proceeding. Setup fastboot & ADB on your computer. Enable USB debugging mode on your device and connect it to your computer via USB cable. or you may use the hardware key combination to enter fastboot mode. If you don’t see a serial number, and instead see “”, fastboot is not configured properly on your machine or the drivers are missing. If you see “no permissions fastboot”, try running fastboot as root. where “***.img” is the name of your recovery file. Note: Some ROMs overwrite recovery at boot time so if you do not plan to immediately boot into recovery, please be aware that this may overwrite your custom recovery with the stock one. it is still in the level “install CWR recovery” the latest message is “”. how can i stop that and exit fastboot mode???? it is still in the level “install CWM recovery” the latest message is “waiting for device”.